Management Ltd offer a full range of waste management services to the commercial and domestic sectors throughout the region. When it comes to the vital task of promoting environmental awareness in the Mid-West, nobody is doing more than Wm Fitzgerald Skip Hire and its sister company Fitzgerald Waste Management. 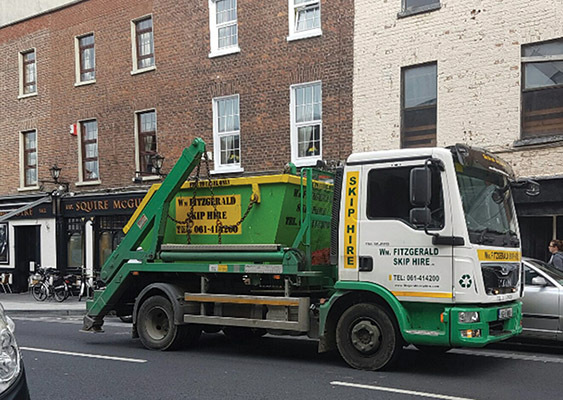 Servicing Limerick city and county since the early 1990s, Wm Fitzgerald Skip Hire is the region’s longest-established waste disposal company. Fitzgerald Waste Management was formed five years ago to provide a domestic wheelie bin service. 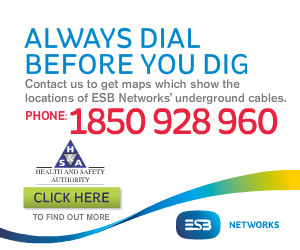 “The two go hand-in-hand,”says Charlie Fitzgerald, who is managing director of both companies. Providing a cost-effective and efficient service for the management and recycling of domestic and commercial waste, the Fitzgerald enterprises are dedicated to the diversion of waste from landfill through the reuse of valuable resources to create close material life cycles. Producing secondary raw materials and reprocessing to produce new products promotes resource efficiency and is an environmental necessity. The success of Wm Fitzgerald Skip Hire and Fitzgerald Waste Management is based on the solid foundations and values of a family-run business that provides a high-quality service to its customers. Specialising in skip hire for the commercial, industrial and domestic sectors, Wm Fitzgerald Skip Hire offers skip sizes to suit all waste requirements, ranging from 2.5 cubic yards to 50 cubic yards. Whether it’s a small garage clearance to a major building renovation, it can provide a solution to suit your needs and budget. The four most popular skips with domestic customers are the mini skip (2.5 cubic yards), medium skip (6 cubic yards), standard skip (8 cubic yards) and bulker skip (12 cubic yards). The larger roll-on and roll-off skips are ideal for sites with bulk waste. With five skip trucks running around the clock in Limerick, Wm Fitzgerald Skip Hire is never any more than a few minutes away from its clients. The modern fleet consists of four MAN chain-lifts and one Volvo hook lorry. Fitzgerald Waste Management (FWM) offers a wide range of collection services and prides itself on providing the best product and service at the most affordable price. Unlike its competitors who have a set price on products, FWM provides a solution to the customer’s problem and follows it through to ensure complete customer satisfaction. Commercial customers can also avail of a range of wheelie bins for mixed waste, recycling or organic. The 1,100 litre wheelie bin is the largest wheelie bin available to commercial clients. Fully licensed by Limerick City and County Council and Clare County Council for waste collection and transfer, the Fitzgerald’s operate a state-of-the-art waste transfer facility on a three-acre site at Rathbane North. Equipped to handle all types of waste, the facility is also open to the public with a pay-and-weigh system in operation. The waste transfer facility is located a mere 500 metres from the family-owned Fitzgerald Business Park in Crossagalla on Limerick’s Ballysimon Road, which is home to a recently-developed office where customers can make payments or discuss their waste management requirements. Ample car parking space is available. Employing 25 staff between them, Wm Fitzgerald Skip Hire and Fitzgerald Waste Management are committed to providing the highest standards in the provision of waste management services to their ever-growing customer-base.